Find hotel near Cementerio Santa Cruz De .. Declared a municipal and national heritage, this interesting hidden gem of Cartagena is a 18th century monument. In a beautiful neighborhood, surrounded by a wall, the graveyard is the final resting place of many iconic historical figures. One of the most enduring mysteries is about which of the many unmarked graves belong to the Nine Martyrs of Independence. Four time president Rafael Nuñez was buried here once upon a time, as was architect Luis Felipe Jaspe. See the huge Fernado Velez Danies monument, and the family vaults of Castillo Espriella and Espriella Abadia. Among the commoners, check the grave of Monica Restrepo. 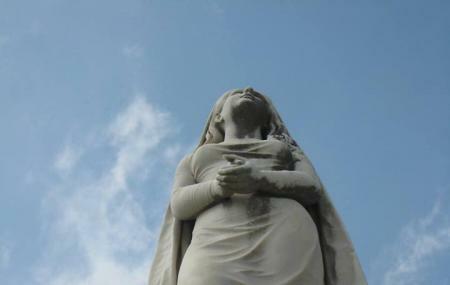 The cemetery is an unusual attraction, worth an entire afternoon. la arquitectura del lugar es hermosa. un excelente lugar para que nuestros seres queridos descansen. Me comento un trabajador q es uno de los mas viejos de Cartagena. Es tranquilo y con muchos mausoleos, en la actualidad le dan un mejor aseo. EN ELLA SE PUEDEN ENCONTRAR VARIEDADES DE LOTES. AUNQUE PASA SUCIA.